A Heavenly View is an attractive holiday apartment in Muizenberg, Cape Town with stunning views over Muizenberg Beach and False Bay. Muizenberg is a small seaside town with its own special charm and the warm waters of Muizenberg Beach is popular for bathers and surfers. 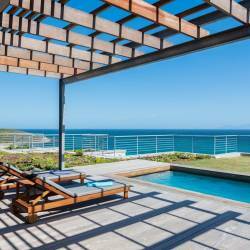 Ideally situated, A Heavenly View is the perfect starting point for a tour around the Cape Peninsula. 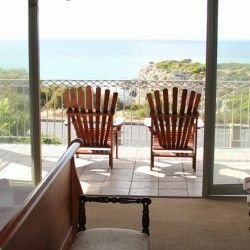 Just a few kilometers away you will find those holiday destinations such as Kalk Bay, Fish Hoek and Simons Town with the world famous penguin colony on Boulders Beach. The large apartment satisfies the needs of the discerning holiday maker. Very generous in size, this colourful Muizenberg holiday apartment has two bedrooms, fully fitted kitchen, dining room, sleeper-sofas in lounge and conveniently features Satellite TV with English and German channels, a beautiful fireplace, a Jacuzzi in one of the two bathrooms and a swimming pool. Situated within walking distance of the beach, restaurants and shops, A Heavenly View with amazing breaker views over the sea, beach and mountains really gives you that holiday feeling!